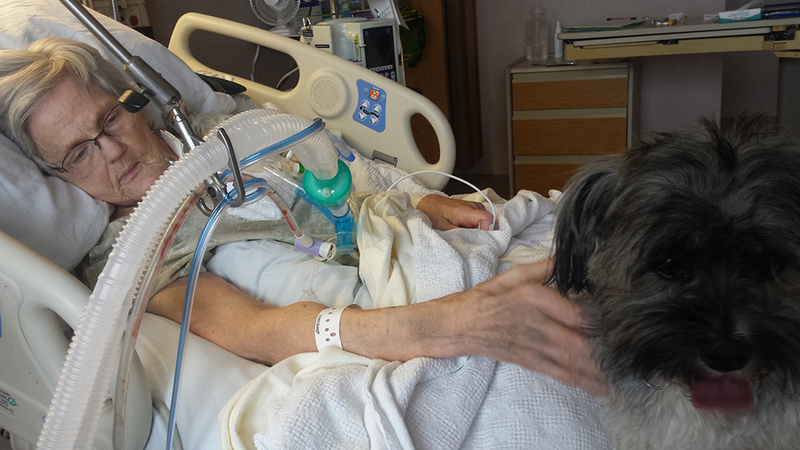 Maryann Newman never expected the series of health crises that put both her and Harley, her beloved husband of 47 years, in the hospital, two floors apart, for specialized care. Maryann never expected the illness that ravaged her lungs, put her on a ventilator and silenced her voice. And Maryann never expected that her nurse would find a way to bring true joy into the hospital room. 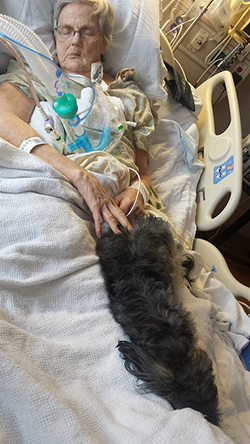 But suddenly a furry bundle of canine comfort was nestled at Maryann’s side. Jane and her sister, who both live out-of-state, visited as much as they could over the long months of their parents’ frequent hospitalizations. Mariah kept Jane updated with daily calls explaining how Maryann was doing. Sensing Maryann grow weaker and more fearful of the journey ahead, Mariah was determined to find a way to raise her patient’s spirits. She asked what Maryann wanted most. “Molly,” was the answer Maryann mouthed silently. Molly is the Havanese dog who had stolen Maryann’s heart and become a much-loved member of the family over the past five years. To arrange the necessary permissions and make Molly’s visit as trouble-free for the family as possible, Mariah called the veterinarian and completed all of the paperwork. Maryann and Molly’s long-awaited reunion is shown in these family photographs. Mariah was recognized for her care and compassion with a DAISY award based on the nomination of this family. The DAISY award is a nationwide program rewarding and celebrating extraordinary nurses.